Alan Turing was born on 23 June, 1912, in London. His parents lived in India due to his father being part of the Indian Civil Service until his retirement in 1926. 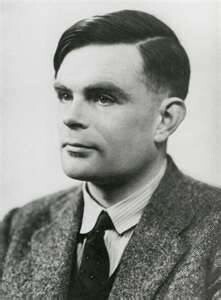 During this time Turing and his brother stayed in England with friends and relatives. Turin was a very bright individual and soon enough he went to Cambridge university to study mathematics. After he had completed his studies he stayed at Cambridge as a teacher. It was at this time that developed the proof which states that automatic computation cannot solve all mathematical problems. This concept is known as he Turing machine and is still considered a rule in modern computation. When he was 24 he wen to study at Princeton University in America and returned two years later. He then began to work secretly part-time for the British cryptanalytic department, the Government Code and Cypher School. When World War 2 broke out he took up full-time work at its base in Bletchley Park. Here, he helped decipher many messages which where encrypted by the Nazis' Enigma Machine, which provided very important intelligence for the Allied Forces. He also took lead of a group of scientists who designed the bombe, a machine which could figure out the settings of the Enigma Machine and read the messages which were put in before they were put into code. After the war had been won by the Allies, he turned his thoughts and ambitions to the development of a machine which could process information using a mind of its own. His colleagues thoughthe was crazy and abandoned him. He then wen to Manchester University where he directed a group of scientists, in the creation of the first computer and handling of artificial data. He committed suicide in 1954 after being tried for homosexuality which was a crime at the time.